I feel like I’ve been going pretty strong with these Travel Tuesday posts! I hope that you are enjoying them as much as I enjoy putting them together. I actually just booked another trip for a destination wedding, this time within the U.S. and to a state that I’ve never been to before. I talk about international travel so much, but the truth is that there are so many amazing places to visit in America too. I’ll get more into my next trip later on, but it’s actually what inspired today’s topic. I am only going away for 4 full days, so it’s important for me to not overpack. My goal is to pack just my carry-on and no other luggage. Can it be done? Yes and I accept this challenge! As I have mentioned before, I am totally the queen of overpacking. I always have been. Now that I am starting to do a lot more travel though I realize what a burden this really is. Honestly, it’s a nightmare. The worst thing is checking in your luggage and finding out that you are over the 50lb limit and then at the end of your trip you see that half of the items in your suitcase were ignored. Like did I really need to bring 7 pairs of shoes, 6 sweaters, 5 pairs of jeans, 4 hats, 3 coats, 2 different hair styling tools and a portable steamer? NO. I literally just laughed out loud as I typed this because as much as I wish it was an exaggeration, it sadly is not. I have really learned my lesson through out the years and each trip I take, I start to bring less and less. My mentality was always well what if I need this and I’ll regret not taking that. I think the thought of being so far away from home and not being able to transport your entire closet can definitely make you feel like you need to bring as much as you can fit in your suitcase. It’s also much easier to pack light when you are going somewhere warm because layers are not needed. So with all that being said, there are definitely ways to fit everything that you NEED into a carry-on only. Plus, this saves you a luggage fee at the airport, the time it takes to wait at baggage claim and it’s so much easier to get around during your travels, especially if you will be hopping on and off trains/busses. After chatting with friends and pretty much just learning my lesson repeatedly, I have some tips to help you out with packing a carry-on for your next trip! 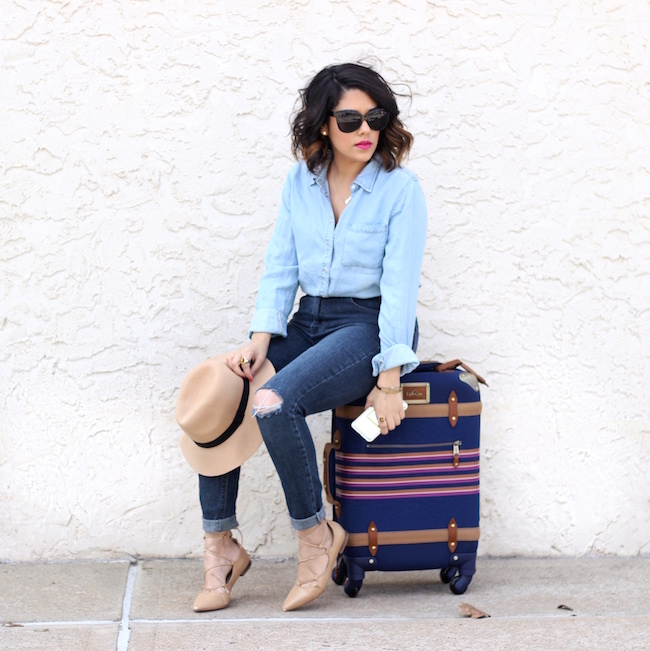 First up is finding the right carry-on to suit your needs. Some are deeper than others, some are bigger than others, but always get one with wheels and make sure to check the measurements to ensure that it will be accepted on the plane. One time I packed a carry-on only for a quick trip and it actually ended up being too big! Also, each airline has their own rules so make sure to look into that before your trip. You want to make sure that your bag will not be overweight. My dad drilled this into my brain every time I took a trip somewhere and I laughed it off. But damn was he right! You have to really focus on what you need to bring vs what you want to take and try to get into that mindset of living with a little less temporarily. I would always pack my laptop, but the truth is I rarely ever took it out during my travels. It was just taking up space and adding extra weight. I would much rather take my camera if I had to pick one. I also used to pack a ton of accessories! Now, I barely bring any. I only pack a few jewelry pieces and 1-2 bags that can be used for the day & night. So before you start throwing in a bunch of “extras,” really ask yourself if you need to bring them. Most airlines let you bring one carry-on and one personal piece on the plane, so take advantage and bring a large handbag that you can pack some more things into. This is usually where I put all of my makeup, some toiletries and any extra things that I can’t fit into my luggage. If you are worried about it being too heavy on your shoulder, just put it on top of your carry-on and wheel them both together when walking around the airport. I always try to think of my personal item as an additional piece of luggage. When I went to Stockholm, I was not sure how cold it would be so I packed one very heavy coat and one lighter one. There’s no way that I could have put the heavy one into my suitcase, so I wore it on the plane even though it made me extremely hot. This is also one of the reasons why I typically wear a hat to the airport. I bring only one now, the one that I know I will wear the most and that goes with everything. Instead of putting it in the suitcase, I wear it on the plane. It saves space. If you are traveling somewhere that’s going to be cold, you can also layer up some of your pieces to the airport, like one of those chunky sweaters. Remember that you can take certain items off while you are on the plane too. This is a great way to save some space and give you the opportunity to bring a bit more items with you. I think I mentioned that in both Ireland & Sweden I wore so many of the same pieces. Focus on packing versatile separates that you can continuously wear in different ways, like button ups, a blazer, black pants and your favorite pair of denim. I probably wore my black boyfriend blazer 4-5 times while I was in Ireland for both the day and the night. I also wore my black knee ripped denim a handful of times too. So think of things that you can wear several times while you are there. Depending on where and how long you are traveling, you can always do your laundry! I know for most of us women, this can be so hard. Truthfully though, I have rarely ever worn all of the shoes that I have packed. Do your best to bring one for the daytime and one for the night that will work with everything. Also, the pair you wear to the airport can count as a third if need be and if there’s room, you can also throw an extra pair of flats or sandals into your purse. So there, I’m letting you pack 4! lol Otherwise keep it to 2 pairs max so that you only have to pack one in your carry-on. I am truthfully more concerned with my footwear for the daytime than the night. I’ve found that I don’t even really get dressed up too much at night when I am traveling, so one pair of heels is really all I need. I even used to overpack my toiletries, but now I just bring the essentials and everything is travel size or put in small containers. Some of these like my contact solution, toothbrush/toothpaste, deodorant & makeup fit right into my personal item leaving extra space in the carry-on. Speaking of makeup, I’ve also learned to not go overboard with all of the products that I bring. I keep it simple with the basics. Worst case scenario, if you left something behind you can always pick it up during your travels. It might even be included in the hotel’s amenities. With Ireland & Sweden, I got used to not bringing my hair dryer. As long as the hotel provides one then there really is no need to take it with you. This is a tip that my mother told me a long time ago. It really allows you to bring so much more because the clothes take up less space. If I am taking any small jackets or something that can’t be rolled then I will lay that out first on the bottom and then I will roll & layer my other pieces on top. I might do a separate post showing how I actually pack my suitcase. I’ve learned through trial and error for sure! I ALWAYS struggle with this haha! Great tips though!! I totally feel your pain, Naty! I am a master of overpacking and forgetting the most important things! :)) I am also getting better though! For instance, now I am taking tons of samples of skincare and beauty products instead of full versions so my suitcase is lighter. I love all of those tips! I'll make sure to bookmark this post and come back to it next time I am packing for vacation! Thank you!